Built in 1912, the 327,000 SF Utah State Capitol had, like so many monumental and historic public buildings, deteriorated over decades of heavy use and deferred maintenance—not to mention its location directly over a geologic fault. 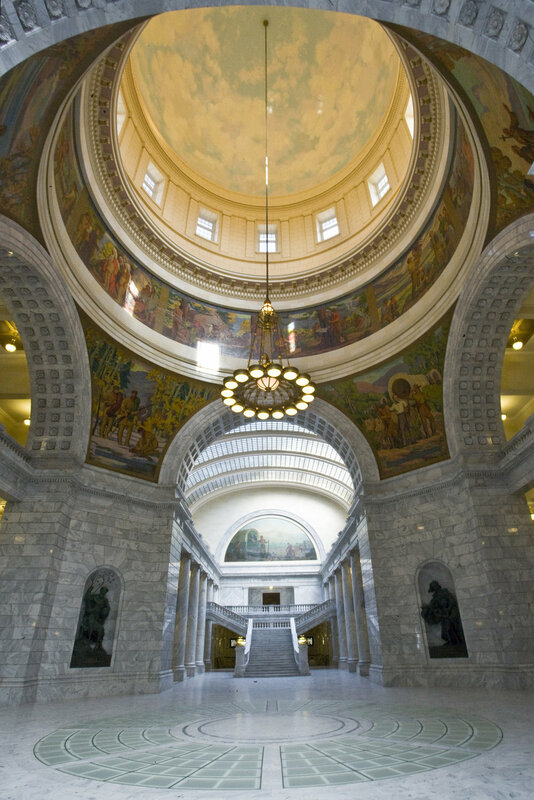 In 1998, the Utah State Capitol Preservation Board began an in-depth master planning process for the building’s restoration, and in 2002 they selected the Capitol Restoration Group (Schooley Caldwell in association with VCBO Architects and MJSA Architects, both local firms) as the design team. While the seismic upgrade was the main impetus for the $227 million project, a full restoration was also designed. The fundamental objectives for the project were to stay true to the architect’s original intentions while improving the building’s functional usefulness. Key historic spaces such as the Governor’s chambers and legislative halls were restored to bring back the original character of the building. In addition, renovation work created secure public and private access points, discreet and efficient service areas, a visitor center, functional committee rooms and efficient office space. Furniture designs preserved the legacy of the past while incorporating the technology of the future.